The ADCLK905 (one input, one output), ADCLK907 (dual one input, one output), and ADCLK925 (one input, two outputs) are ultrafast Clock data Buffers fabricated on the Analog Devices, Inc., proprietary XFCB3 silicon germanium (SiGe) bipolar process. The ADCLK905 ADCLK907 ADCLK925 feature full-swing emitter coupled Logic (ECL) output drivers. For PECL (positive ECL) operation, bias VCC to the positive supply and VEE to ground. For NECL (negative ECL) operation, bias VCC to ground and VEE to the negative supply. The Buffers offer 95 ps propagation delay, 7.5 GHz toggle rate, 10 Gbps data rate, and 60 fs random jitter (RJ). The inputs have center-tapped, 100 , on-chip termination resistors. A VREF pin is available for biasing ac-coupled inputs. The ECL output stages are designed to directly drive 800 mV each side into 50 terminated to VCC 2 V for a total differential output swing of 1.6 V.
The ADCLK905 ADCLK907 ADCLK925 are available in 16-lead LFCSP packages. This is one package pinout of ADCLK925,If you need more pinouts please download ADCLK925's pdf datasheet. 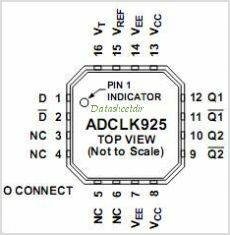 ADCLK925 circuits will be updated soon..., now you can download the pdf datasheet to check the circuits!